Our favorite breakfast food friends are back and all bready for their next adventure Can they save the fridge before all the food is iced? It's mission . . . defrostable. I've got my revenge and I'm serving it cold "
Brrr There's a frost in the fridge--and it's hardened Pudding Pond and frozen Yogurt Falls. Agent Asparagus is on the case, and she begs Lady Pancake and Sir French Toast to join her superspy team. But when the enemy snatches Asparagus, Pancake and French Toast have only one dough man to turn to for help: the evil Baron von Waffle Will he help them save the fridge . . . or are they doomed to become frozen food? 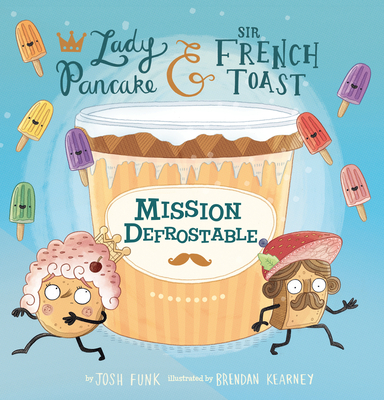 Josh Funk is the author of Lady Pancake & Sir French Toast (Sterling), followed by its sequel The Case of the Stinky Stench (Sterling), Albie Newton (Sterling, 2018), How to Code a Sandcastle (Viking), Lost in the Library (Henry Holt), and more. He lives in Concord, MA. Brendan Kearney is also the illustrator of the first Lady Pancake & Sir French Toast, its sequel The Case of the Stinky Stench, and Bertie Wings It (all Sterling). He lives in St. Albans, UK.